By the late 1970’s, top level endurance racing was threatening to collapse in on itself. The advent of massively powerful turbocharged engines had created an unfairly balanced playing field. Because of the novelty and technical complexity, the new powerplants were inaccessible to virtually all teams and manufacturers. With Porsche establishing a dominant position as a result of their wildly successful turbo flat six, the Federation Internationale l’Automobile realized it needed to intervene to ensure parity and keep the sport alive. Additionally, the governing body felt it had to respond to the radical social and economic changes occurring due to a pair of devastating energy crises. As national economies wound down across the globe and fuel prices soared, the grids slowly bled out as manufacturers lost interest. With these threats in mind, the FIA decided to streamline its major categories across the board for 1982. Porsche's Typ 935 engine was threatening to overpower its competitors. Instead of the confusingly inconsistent system based on numbers (Groups 1-7), the new structure was to be based on the alphabet. Group A would cover production-based touring and rally cars, Group B governed more extreme rally specials and GT-racers, while Group C was reserved for top flight endurance racing prototypes.Through this new set of regulations, the FIA directly targeted the issues confronting the sport. In an effort to put a stop to the reign of the infinitely adjustable turbo, a maximum fuel limit was instated. Each car was consigned to five fuel stops per 1000 km race, for a grand total of 600 liters. This not only introduced a much-needed environmentally conscious element to the series, it also ensured a more level playing field. With limited fuel available, turbo-powered cars were effectively unable to simply turn up the boost every time a competitor got too close. This enabled larger, naturally aspirated engines to compete directly with smaller turbocharged engines. Group C grew out to be one of the most popular series on the planet. The end result was a tremendous response from manufacturers, teams and fans alike. Group C attracted factory involvement from Toyota, Mercedes-Benz, Jaguar, Porsche, Mazda, Ford, Lancia, Nissan and Aston-Martin. Helped by global economic recovery and a renewed interest in motorsport, the championship exploded in popularity in just a few short years. Its influence even reached far beyond the offices of the FIA, as the American International Motor Sport Association incorporated similar regulations, save for the fuel limit, in the equally popular IMSA Camel GT series, and the All Japan Sports Prototype Championship captured the imagination of Japanese racing enthusiasts. With semi-works outfit WM, Peugeot set an all-time speed record in 1988. The flash success enthused all involved, but for one man. Bernie Ecclestone had been watching the rise of Group C with wary eyes. Bit by bit the prototypes gained traction in the world of motorsport, eating away at the market share of his beloved cash cow: Formula One. Feeling the pressure, he decided to act in the only way he knew how: as destructive as was humanly possible. To this end he contacted former March executive and good friend Max Mosley, who had risen to a prominent position within the FIA. Together the pair managed to secretely pull a few strings left and right, and a plan of attack was quickly formed. Ecclestone would strike on three main fronts. The cheaper Group C2 had to die to bring the series to its knees. First he would get rid of the densely populated C2 category intended for privateers, using a supposed lack of reliability as an excuse. Then he would drive up the cost of competing by laying out an erratic race schedule with rounds all over the globe. Most importantly though, the brilliant engine formula was corrupted to only allow 3.5L naturally aspirated piston engine, the exact same as used in F1 since 1989. Instead of ensuring a crude balance of performance, the new rules were designed to act as a lure to the large manufacturers who would be left standing in the ruins of the World Sportscar Championship after all the privateers had left. In essence, these companies would have been forced to construct F1-engines for their prototypes. These would come in handy for an eventual F1-adventure after the death of the WSC, as the massive investment would make the car makers hesitant to simply pull the plug. Peugeot's SA35-A1 V10 was the center of their sportscar program. With the plan set up, Ecclestone’s FIA set the new formula’s introduction for the 1990 season. Unsurprisingly, the move was met with widespread disapproval. The many privateer teams operating in Group C2 were understandably furious, as were a great deal of fans. Moreover, the large brands weren’t exactly enthusiastic either. The naturally high-strung nature of the new engines would naturally cause a whole host of problems, as they were nowhere near suited to the rigors of racing for 24 hours straight. Seeing these glaring problems lurking ahead, Mazda, Jaguar, Nissan, Mercedes-Benz, and Toyota successfully lobbied to postpone the changes for another season, while Aston Martin and Porsche dropped out altogether. 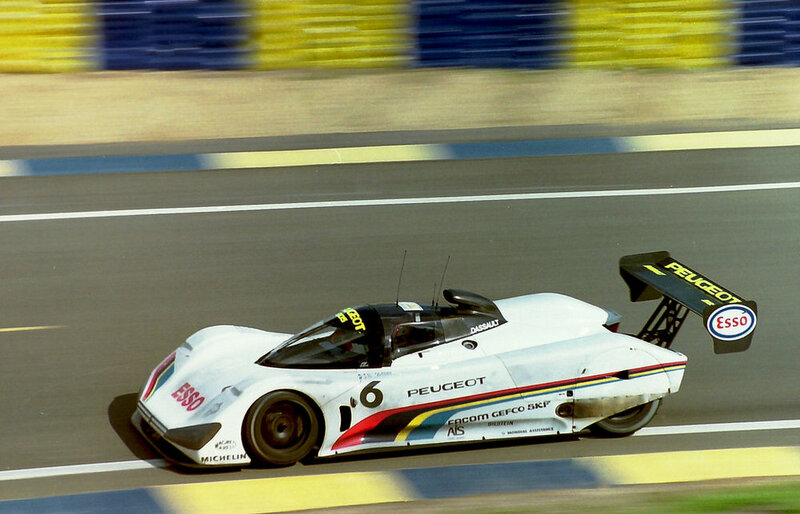 Peugeot's first ever Le Mans prototype: 1990's 905. Despite the delay, some firms were eager to try out the formula as early as 1990. Former C2 constructors Spice and Alba dipped prepared an assault for the first 3.5L season, as well as newcomers Norma, The biggest addition to the grid however was French automotive giant Peugeot. As engine suppliers, the company had supported the private effort of employees Gerard Welter and Michel Meunier since 1976. The collaboration eventually culminated in the all-time speed record on the long uninterrupted Mulsanne straight, as Roger Dorchy managed to reach 405 kph (251 mph) with the streamlined twin turbo Peugeot PRV V6-powered P88. The 905 took styling cues from the company's road cars. The massive venturi tunnels weren't found on the 405 however. 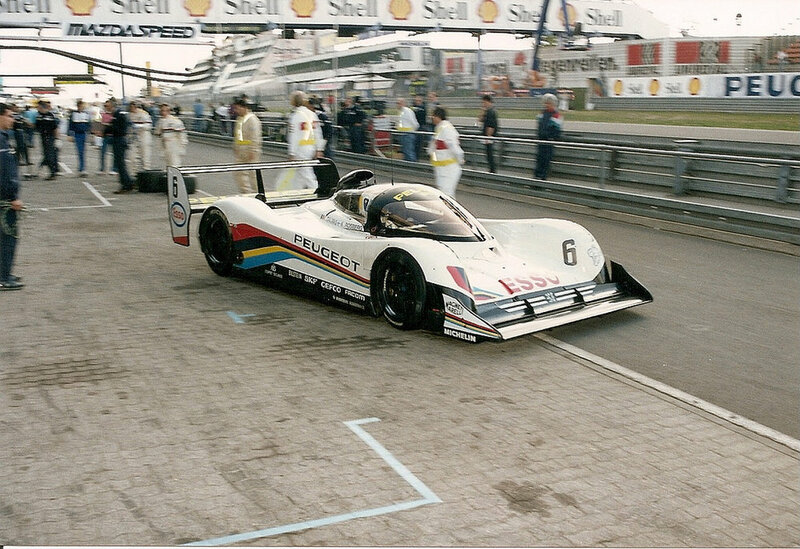 However, Peugeot had never before fielded a full blown factory team in the World Sportscar Championship. This was about to change. Under the direction of the head of Peugeot Talbot Motorsport, former rally co-driver Jean Todt, Peugeot set up a new base of operations in the suburbs of Paris in 1988. Todt had already been responsible for the firm’s flash success in Group B rallying in 1985 and 1986, and was seen as the ideal man to drive the brands success even further forward. Under his management a carbon-fiber monocoque chassis was constructed by specialists Dassault, while a crack team of elite Peugeot engineers set about developing a suitable engine. With the maximum refuelling limit set to be abandoned to accommodate the thirstier high-revving 3.5L engines, Peugeot basically had free reign in designing the new powerplant. One thing they had to take into account however, was the car’s chassis. Unlike Formula One machinery, Group C sportscars were still allowed to use the dark art of ground effect aerodynamics. A crude schematic image of the workings of a ground effect underbody. This technology had been banned in F1 due to safety concerns since 1983, but Group C was still taking full advantage of it. This affected the choice of engine layout because of the room needed for the two large venturi tunnels located in the car’s structure. By forcing air through them, the car created a low pressure area under itself, and sucked itself into the road. This increased downforce, which put more pressure into the tires and made the car grip much harder. If done perfectly, a ground effect racer could generate as much if not more downforce than a conventional car with minimal aerodynamic drag. A flat engine like the one Porsche preferred could possibly block the path of these tunnels, completely negating any advantage in weight distribution thanks to the loss of downforce. Therefore, Peugeot decided on a more traditional V-engine as a perfect compromise between center of gravity and venturi tunnel accessibility. A more unusual feature of this layout however, was the number of cylinders. The 905 testing at Paul Ricard. A six-speed manual gearbox transferred the fury to the rear wheels. Minimum weight was set at 50 kg (110 lb) lighter than the old Group C cars, which constituted a figure of 750 kg (1653 lbs). Aerodynamically the 905 was rather conservative, as it followed the trends set by earlier Group C designs. This resulted in a remarkably smooth body with very distinctive spats covering the rear wheels. After a presentation on July 4, 1990 at Paul Ricard, the 905 made its debut at the penultimate round of the 1990 WSC season, the Player’s Ltée Mondial Montréal held at the stupidly quick Circuit Gilles Villeneuve. There the car would face the old guard of Group C.
Excessively powerful turbocharged cars like the Mercedes-Benz C11, Nissan R90CK, Jaguar XJR-11, Toyota 90C-V and various versions of the venerable Porsche 962 were all present on what was essentially a pure power circuit. With over 1000 horsepower in qualifying trim, cars like the Nissan R90CK completely outgunned the 905. Despite being in the skilled hands of two time Grand Prix-winner and qualified engineer Jean Pierre Jabouille (FRA) partnered with 1982 F1 World Champion Keke Rosberg (FIN), the single Peugeot entry couldn’t make it pas 12th place on the grid. It was rapidly becoming painfully obvious how much slower the new Group C cars were in a straight line. A time of 1:29.257 saw the French squad 4.2 seconds behind the pole sitting Mercedes-Benz of Jean-Louis Schlesser and Mauro Baldi. A more positive aspect of this was the fact the 905 had beaten the next 3.5L car by 3.7 seconds, although this Cosworth-powered Spice SE90C driven by Wayne Taylor and Fermin Velez was a low-budget hobby project compared to the multi-million franc Peugeot. Adding insult to injury, the bargain-basement Spice managed to finish, while the French machine suffered a fuel pump failure in the early stages. The Peugeot struggled to keep up with the previous generation of Group C monsters. Rosberg and Jabouille remained the only partnering running the 905, as the WSC circus moved to Autódromo Hermanos Rodríguez in Mexico City. Although slightly twistier than Montreal’s venue, the circuit still favored high horsepower cars, which saw the sole Peugeot lag behind in 11th position on the grid, four seconds slower than Martin Brundle (GB) and Jan Lammers (NED) in their Jaguar XJR-11. This time the car did manage to finish, if only in 13th place. The exercise had left Rosberg and Jabouille with an eight lap deficit on the winning Mercedes-Benz of Jochen Mass (GER) and Michael Schumacher (GER), which rounded out the season for Peugeot with another dismal result. The flat-12 Mercedes-Benz C291 and V8 Jaguar XJR-14 were Peugeot's main rivals for 1991. As Peugeot failed to make an impression, the Bernie Ecclestone-run FIA had been watching very closely. The planned shift to 3.5L cars finally happened in 1991, but the governing body discovered to its surprise that the grid had gone down from 27 to just 7 eligible cars in a single season. In effect, just three major manufacturers were now left in the series, as Mercedes-Benz and Jaguar were the only other two companies ready with a 3.5L design. Single private entries from Spice and ALD were simply not enough to keep the championship afloat. Those with a vague grasp on sanity realized the severity of the situation, and allowed last year’s turbo monsters in provided they be willing to take a 100 kg (220 lbs) weight penalty to even out the playing field. Keke Rosberg/Yannick Dalmas (6) taking the fight to Derek Warwick in the Jaguar (3), while Mercedes' Karl Wendlinger/Michael Schumacher (2) follow from behind, WSC Suzuka, 1991. At the first round of the season on the beautiful circuit of Suzuka, the proposed changes were finally starting to take effect. The humongous weight penalty had crippled the remaining turbo cars, leaving the new 3.5L Group C to finally take over control of the championship. Peugeot was still struggling however. The team had expanded to two cars for Keke Rosberg and F1-driver Yannick Dalmas (FRA), while the other was given to Mercedes-defector Mauro Baldi and crash-happy F1-driver Philippe Alliot (FRA). In spit of the reinforcements, the French squad were struggling against the new arrivals. Rosberg/Dalmas were forced to give a demoralizing two seconds to the solo-driving Derek Warwick in the Jaguar, with the Mercedes a mere second behind. Things were looking rather bleak in the Peugeot camp, but on race day all would fall in their favor. The Jaguars proved to be just as unreliable as they were quick, with Brundle/Fabi encountering a fuel pickup problem on lap 4, and Warwick stranded in the pits after a burnt starter cable. The Mercedes of Wendlinger/Schumacher suffered a fire on lap 28 after their refuelling valve failed to shut, which left the 905’s without competition. Even though Yannick Dalmas also experienced trouble with engine failure on lap 38, Baldi/Alliot were able to get through the race unscathed and take Peugeot’s lucky maiden win. Despite obvious teething problems, Peugeot was able to skate to a surprise victory in the first round of the 1991 WSC season. The second round of the season took place at Monza, the Temple of Speed. By now the Jaguar was already starting to assert its total dominance, as the British squad locked out the front row of the grid with slowest XJR-14 enjoying a 4 second advantage over the fastest Peugeot (Baldi/Alliot) in third. Rosberg/Dalmas made it until 11 laps before the end when their engine expired again, while Balid/Alliot finished a distant eight, six laps down on the winning Jaguar. 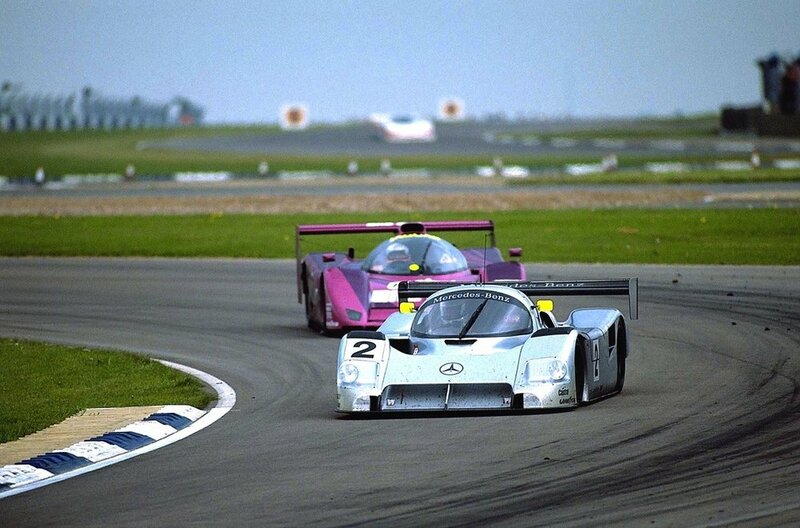 The theme continued at Silverstone, where the purple cats again utterly outclassed the field. The gap came down to another four seconds to Peugeot, who were frustratingly becoming “best of the rest”. Apparently Tom Walkinshaw Racing had a much better understanding of the new 3.5L rules than the French auto giant did, as success kept on coming for the British squad. Unsurprisingly Silverstone was also won by the Brits, with Baldi/Alliot finished sixth, five laps behind the winner. Keeping true to form, Keke Rosberg and Yannick Dalmas finished the day in a cloud of smoke with an engine failure on lap 50. Wendlinger/Schumacher fighting Rosberg/Dalmas, Silverstone 1991. With the first three rounds of the WSC out of the way, it was time for the main event: the world-famous 24 Hours of Le Mans. On their home soil and facing the most prestigious race on the calendar, Peugeot pulled out all the stops. Keke Rosberg and Yannick Dalmas received the company of F1-driver turned endurance specialist Pierre-Henri Raphanel (FRA), while Mauro Baldi and Phillippe Alliot were joined by their old friend Jean-Pierre Jabouille. A total of four cars were brought to Le Mans, but two of these examples functioned only as reserves. The race cars and T-cars for the 1991 24 Hours of Le Mans. In qualifying the 905’s did well, as Baldi/Alliot/Jabouille recorded a third time some four seconds off the pace of the pole-sitting Mercedes-Benz C11 of Jean-Louis Schlesser/Jochen Mass/Alain Ferté and the Jaguar XJR-14 LM of Andy Wallace (GB). Fortunately for the team though, Jaguar backed out of running the XJR-14 at the last second, as they were unsure the car would last the full 24 hours. Because older Group C cars were still eligible to compete for 1991, the company opted tot instead campaign their much more reliable 7.0L V12 XJR-12 model. Mercedes-Benz followed suit, abandoning the 3.5L C291 for the 5.0L twin-turbo V8 C11. With much larger displacement and proven technology, these elder brutes were still a force to be reckoned with despite their horrendous weight penalty. The Peugeots inadvertently headed the field for the 1991 edition of the 24 Hours. Although the C11 had been fastest in qualifying despite the addition of two chicanes on the endless Mulsanne straight., the FIA reserved the first ten spots on the grid for “Category 1” 3.5L machines. Keke Rosberg/Yannick Dalmas/Pierre-Henri Raphanel on the recently interrupted Mulsanne straight, 1991. This left Peugeot starting first and second.Sadly for Peugeot, their competitor’s decisions had been the right one. After just 22 laps, The#5 Alliot/Jabouille/Baldi car sputtered to stop with a ruined engine after surviving a massive pitlane fire, leaving the team with just one car still in the race. Unlike their rivals, Peugeot didn’t have the option of running older, more reliable cars, as the 905 was their first ever sports prototype. Just 44 laps later, Keke Rosberg parked his car next tot the armco on Mulsanne Straight with a ruined shift linkage. And just like that, Peugeot’s first Le Mans adventure as a factory team was over, only 17 minutes before the lowly 6 hour mark. Severely disappointed by their performance at the most important race of all, the company focused on trying to solve the underlying issues with the 905. Aside from the painfully obvious reliability issues, the car was simply too slow. Peugeot identified the rather unimpressive aerodynamics package as one of the biggest causes of this problem. Traditionally, the classic turbocharged or large displacement Group C types had possessed so much horsepower that downforce had almost become an afterthought. The smooth-bodied 905 was terribly suited to the new 3.5L era. The long straights of Le Mans combined with these savage engines created the need for speed in a straight and bumpy line, while the cars where lacking in the corners even with ground effect. The 3.5L cars on the other hand were as much as 400 horsepower down on these dinosaurs, which prompted Mercedes-Benz and especially TWR-Jaguar to reinvent the wheel. Because of the horrendous lack of straight line speed, the teams would need to claw back the seconds lost in the corners with more aggressive bodywork. This was something Peugeot had failed to take into account. Jaguar on the other hand had created a car so efficient at generating downforce it was able to comfortably qualify at the back of a Formula One grid. At the Nürburging GP-Strecke Peugeot introduced a heavily revised 905B. Peugeot realized that to match the big purple cat, the 905 would have to undergo a complete transformation. With this in mind the car was completely torn apart until only its basic monocoque and cockpit were left. The new car, dubbed 905B, featured uncovered rear wheels, a sharper waistline, a double plane rear wing copied from Jaguar, and a gargantuan front splitter resembling a oversized snowplow. The original 905 was now officially dead, and all bets were off in the furious battle against the Jags in a dying world. The Peugeot 905 was the company’s first foray into the pinnacle of endurance racing. Sadly the firm chose the worst possible time and way to enter, as Bernie Ecclestone was just busy laying the World Sportscar Championship to waste for his own personal gain. Thanks to this hateful sentiment, Peugeot was forced to build an achingly good-sounding, but utterly terrible racing car. Designed with a high-strung and fragile Formula One-style V10 per Bernie’s recipe, the 905 turned out to be virtually useless on track. Although it managed a lucky win in its first full season, it was completely blown away by the blisteringly fast Jaguar XJR-14, which had exploited the new rule book to the fullest. With a few essential wake-up calls, Peugeot was moving in the right direction after Le Mans. Their only hope was to get there before Ecclestone’s deliberately wonky house of cards would collapse in on them.